Photograph courtesy Larry Goddard. 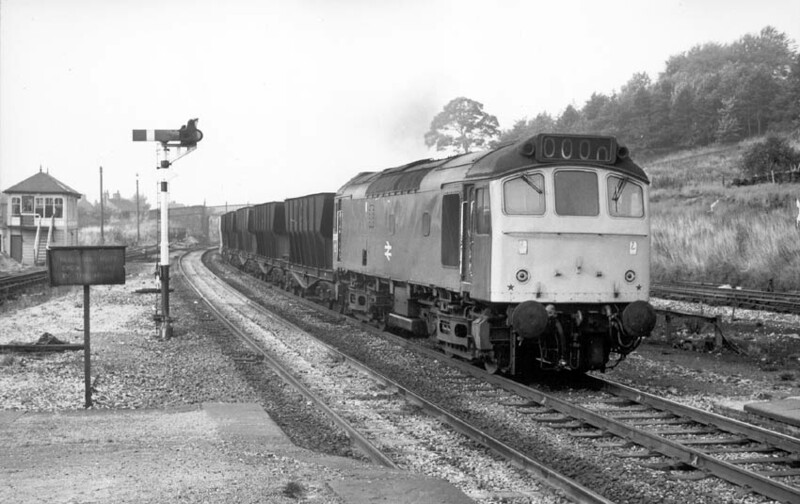 An empty limestone train heads eastwards through Chinley on September 24th 1977 behind 25137. At this time 25137 was allocated to Springs Branch. A great variety of London Midland Region depots were the home for D5287/25137 during its sixteen year three month career. Center lampbracket & other fittings removed (No.2 cab only). June 1965 to London Midland (Midland) Lines. February 1976 to Springs Branch. 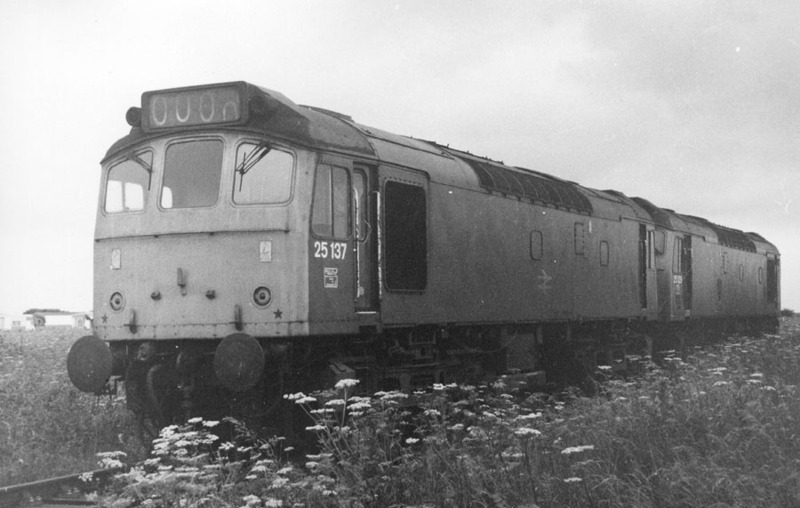 25137 was the 61st Class 25 withdrawn, one of seventeen retired during November 1980. After withdrawal 25137 was briefly moved to Derby Works then returned to Toton. 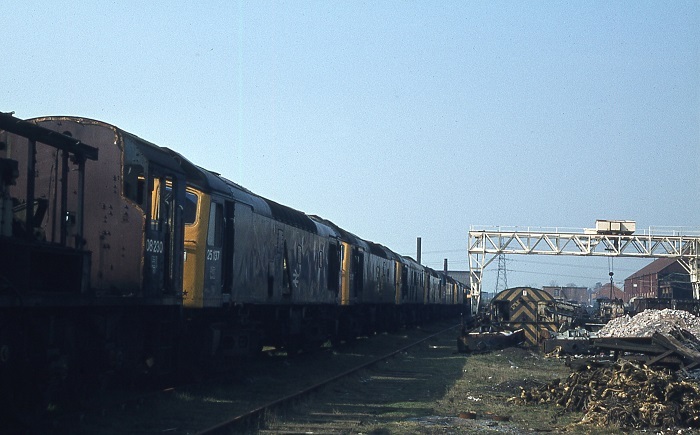 On January 12th 1981 08027, 25026, 25103/137 moved from Toton to Swindon Works behind 31289. 25137 was scrapped at Swindon Works by the middle of May 1983. Photograph collection of webmaster. 08230 & 25137 head up a line of scrap locomotives at Swindon Works during May 1981. Noted Derby Works May 1976 (Classified assumed). The first two recorded passenger workings for D5287/25137 involved the summer dated Nottingham - Llandudno Town turns, working round trips on August 7th & 14th 1965. Seven years would pass before another passenger working was recorded, on September 29th 1972 5287 & 5234 worked the 11.30 St. Pancras - Nottingham throughout. February at month end Crewe based D5287 spent some time at Ayr on freight duties, having come into the area from Carlisle, substituting for a defective D5056. On May 25th 25137 & 25245 worked the 14.30 Yarmouth - Birmingham New Street from Norwich. November 9th saw the stock for a Hertford – Birmingham special arrive at Enfield Chase behind 25137 & 31216. In running round the train the Class 31 derailed, leaving 25137 to take the special out. 31223 was added at Hitchin and both were replaced by a pair of Class 31’s at Peterborough. 25137 with a coal train was noted northbound through Bishop Stortford on April 22nd. 1975 brought several passenger workings with quite a variety. On June 7th 25137 & 25121 worked the Derby - Norwich - Yarmouth - Norwich - Walsall diagram. On June 13th 25137 & 25111 worked an evening Mossend - Kingmoor freight. June 23rd found 25137 in charge of the 16.15 Bristol – Newcastle, it was declared a failure at Darlington, being removed here, later repaired and put to use on local workings. By June 28th 25137 was back in the Midlands, again with 25121 it worked the Derby - Norwich - Walsall - Norwich - Walsall diagram. On August 9th the 14.00 Penzance - Birmingham New Street was worked throughout (?) by 25195 & 25137. Later that day the 23.55 Liverpool - Penzance was noted west of Truro behind 25195 & 25137, having possibly worked from Birmingham New Street. 25137 was back on the Western Region on July 2nd working the 12.45 Cardiff - Weston-super-Mare. There are no recorded passenger workings for 1977. 25137 & 25219 were noted on a Kennett bound stone working on April 11th. On June 20th 25137 was noted passing Perry Bat with a short four van fitted freight. 1978 brought more visits to the east coast seaside resorts. On July 1st 25137 & 25129 worked the 08.00 Walsall - Yarmouth to Norwich returning with the 14.15 Yarmouth - Derby from Norwich. The same pair then visited Skegness, on July 2nd from Derby & on July 3rd from Leicester, for a three day total of 720 passenger miles. A rescue job on July 27th involved the 07.57 Huddersfield - Largs day excursion which required assistance from 25137 & 25154 between Long Preston (MP 233) and Carlisle when 40147 failed and was dragged. It was back to Skegness on August 28th (relief) & 29th with roundtrips from Leicester with 25126. Photograph collection of webmaster. 25137 & 25129 out to grass somewhere amongst the daisies and caravans. This maybe July 2nd 1978 when both locomotive were recorded on a Skegness working. During the morning of October 28th 25137 was noted at Cricklewood, by mid-afternoon 25137 was northbound through Derby with a steel train. 25137 was noted at Northwich on November 19th. The late afternoon Bristol - Plymouth vans was worked by 25137 on February 13th. On April 5th 25137 derailed in Hatfield up yard, after rerailing it returned light to the LMR apparently none the worse for wear. A lengthy day excursion for 25137 & 25074 took place on May 19th working a roundtrip Maryport - Stratford-on-Avon, a total of 427 miles. On June 9th an Open Day was held at Toton depot, on view to the public were over eighty locomotives, which included 25137 and twelve other Class 25s (25073, 25130/134/136/197, 25254/260/296, 25305/307/314/320. Also present were the four remaining Class 44s. A diesel multiple unit failure on September 22nd saw 25137 work a morning Crewe - Derby service. On June 7th 25137 was noted southbound at the site of Woodhouse Mill station with a mixed freight. The No.1 cab still retained a four-character headcode panel. Although 1980 was the last year in service for 25137, it did produce a fair number of passenger workings after June. The 13.15 Birmingham New Street - Norwich on June 14th was worked throughout by 25137. Towards the end of June 25137 was north of the border and was quickly put to good use, working the 08.55 Edinburgh - Aberdeen and 12.40 return on June 28th and the 17.33 Dundee - Glasgow Queen Street on June 30th. On August 8th 25137 & 25276 worked the 07.40 Euston - Aberystwyth from Wolverhampton, returning with the 17.55 to Wolverhampton. The last recorded passenger workings for 25137 took place on August 16th 1980 with 25127 working the Derby - Norwich - Yarmouth - Norwich - Walsall diagram. The York – Edinburgh parcels on June 21st was in charge of 25137. 25137 was withdrawn on November 2nd 1980.